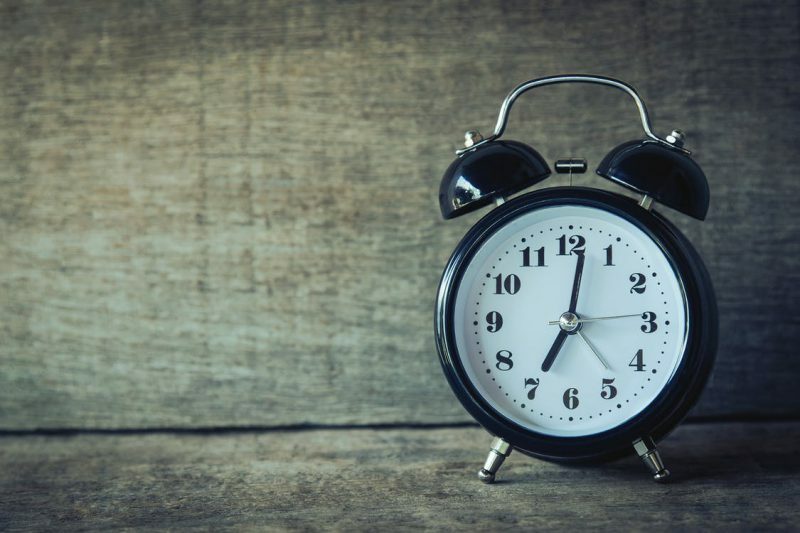 Beware: “Sentiment” is Not an Exact Market-Timing Tool - Dohmen Capital Research, Inc.
Analyst David Stockman, former budget director for President Reagan, said on CNBC, “a gigantic, horrendous storm” is not far away. All these people have decades of experience in the markets. They are well known and we like to read their analysis of the markets. But there are times when our view diverges. As you can see in the chart below, the large trading firms (i.e. large speculators) have been reducing exposure to growth stocks throughout the year (blue line), even while the Nasdaq 100 (green line) has continued to climb to new record highs. 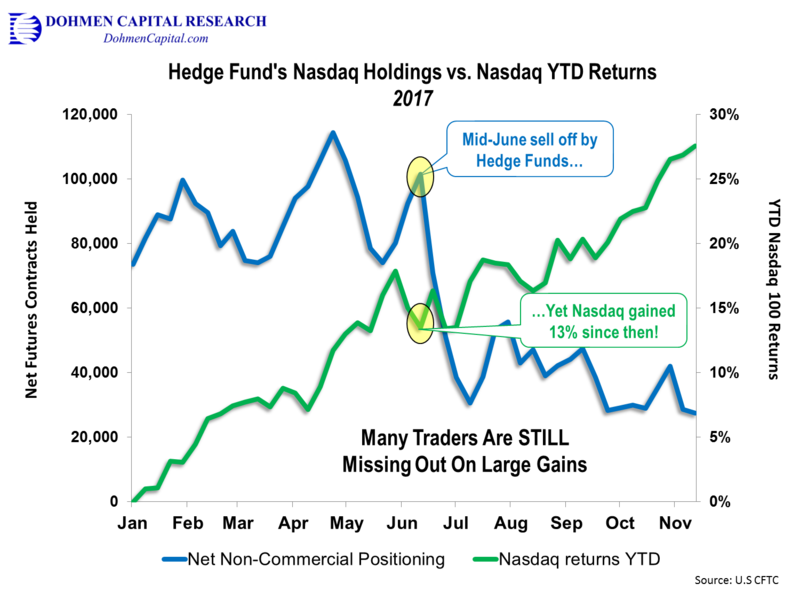 Large hedge funds that have been selling growth stocks have probably missed out on the 30% gains on the NASDAQ this year. Even since mid-June, when they started dumping their positions, the index shot up another 13% from its July low. The story is even worse for the funds that have been short selling growth stocks. With top names like Facebook, Amazon, and Apple rising sharply, many managers that shorted these stocks based on their “high valuations” have accrued large losses this year. Back in July these losses totaled over $7 billion. By now that figure may be well over $10 billion considering the recent run-up in growth stocks. He just does not understand why he is losing money. The reason is that valuations don’t seem to matter. That has been our view for 40 years. Otherwise why would the market sell at a P/E of 9 and still be declining in a bear market, and another time sell at a P/E of over 150, and be a great buying opportunity as at the bear market bottom of March 2009? The traditional “value investing only” approach does not work in this environment. Valuation is not a market driver in euphoric times. Those who practice value investing will seriously underperform. Since early September, we have given our optimistic view on the market for the near term. In early in November, we also wrote in our Wellington Letter that there would be a brief downturn in the market in November. Although the indices did okay during October – November, the majority of stocks had pullbacks and corrections. In our November 7th issue, we outlined our expectations for the market to going into January. It remains to be seen whether that is correct. Passage of the tax reform bill presents an important unknown. We were successful on March 10, 2000 and calling that top to the day, and hope to be able to get reasonably close again this time. However, because market forces are no longer the primary influence for the stock market, it is much more difficult this time. We are still bullish on the market going into January. After that, we will have to be on the lookout for signs that would indicate a top. We may or may not get such signals at that time. Until that time, it is very possible that the market will have a pullback, probably in November. However, such a potential pullback should be well supported by new buying. You see, all the things you watch and hear in the media about the investment markets are almost irrelevant. They talk about earnings, P/E ratios, future developments of the firm, and then the gadgets the firm makes. All of these make good stories for the media, but they usually fail to make investors’ any money. Such analysis is the difference between serious investors suffering big losses or making incredible profits. And that is why many of this most astute investors and professionals subscribe to our Wellington Letter. In fact, our flagship investment newsletter has successfully guided some of the wealthiest investors around the world, which is why it is now in its 40th year of excellence. If you want to beat the markets, you want to be in the ‘winning minority,’ not with the crowd. Contrarian thinking, when properly applied, is the key to investment success. Founder Dohmen Capital Research, Inc.